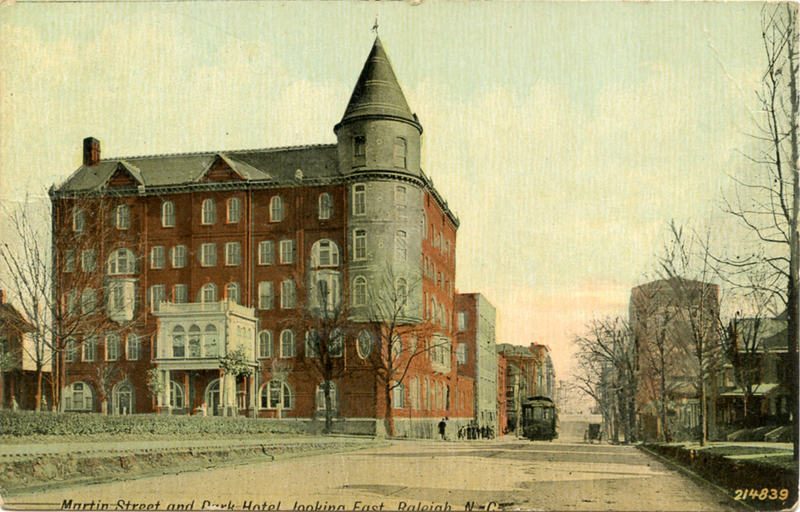 Martin Street and Park Hotel, Looking East, Raleigh, N.C. This beautifully tinted depiction of the Park Hotel on Nash Square is our featured postcard on Flashback Friday this week. The image harkens back to simpler times in Raleigh of more than a century ago. 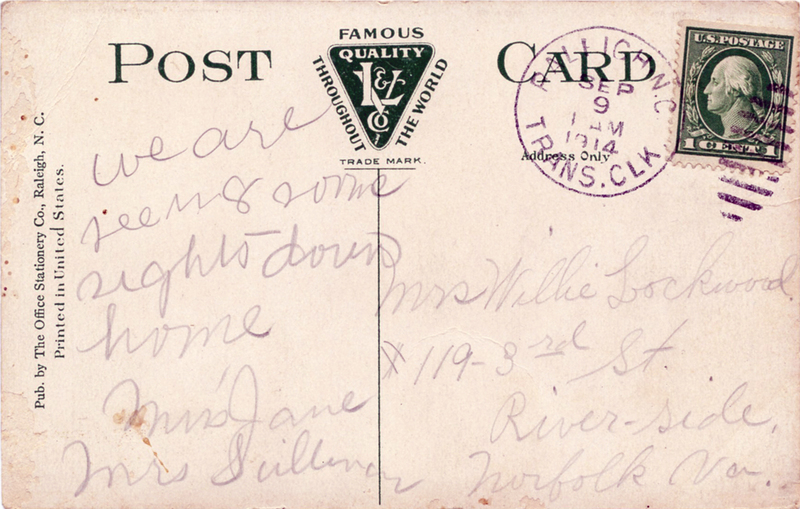 This week’s card was postmarked on September 9, 1914. I am curious about the message on this week’s card. Apparently, Mrs. Sullivan and her companion Miss Jane were traveling by train to an unknown destination, and stopped off in Raleigh to take in the “sights.” I wonder what their relationship to Mrs. Lockwood was. Perhaps the two sojourners lived in Norfolk, were originally from North Carolina, and were passing through Raleigh on their way “down home.” Guess we’ll never know. One thing we do know for certain — Mrs. Sullivan and Miss Jane were traveling by train. The postcard was stamped with the ‘TRANS. CLK.’ (i.e. Transfer Clerk) cancellation mark. This was a ‘railway mark’ applied by a post office employee working in a transfer office, or terminal Railway Post Office (RPO). These RPOs were typically located in larger towns where mail was routinely transferred between, or directed to, connecting railroads by transfer clerks. Letters or postcards with this cancellation mark were usually written by someone either getting on or off a train, or dropped in a box at the depot; thus they were able to be quickly dispatched without having to be processed through the local post office. 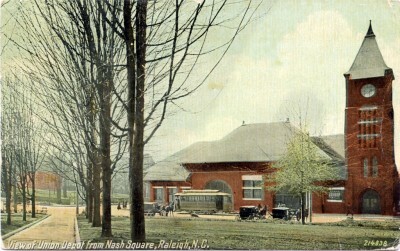 This makes sense here, as Raleigh’s railroad depot, Union Station, was located just a block away, across Nash Square from the Park Hotel. This postcard depicting Union Station was mailed in 1913. 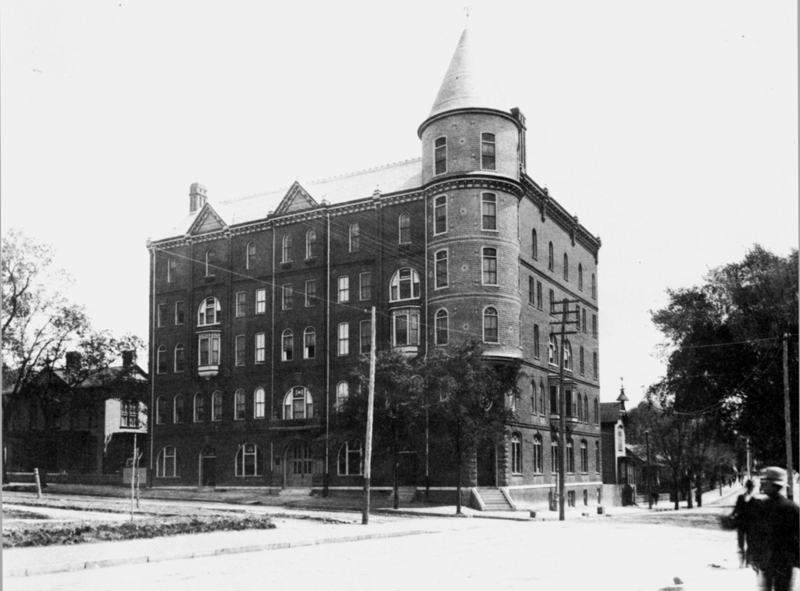 The Park Hotel underwent many changes from the time it was built in 1893 until its demolition in 1975. Sadly, the loss of this magnificent Victorian landmark has left an unfillable void in Raleigh’s historic architectural urban landscape. This view of the Park Hotel dates to the early years of the 20th century, and shows how it appeared when first built in 1893. Our Flashback Friday tinted halftone postcard this week was published by the Office Stationery Co. of Raleigh, and printed by Leighton & Valentine of New York, NY. 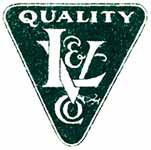 Formed by the merger of the Hugh C. Leighton Company with Valentine & Sons, and Sackett & Wilhelms. Their cards were printed in the tinted halftone style of Valentine & Sons. Some of their white border cards were printed in continuous tone lithography. All these cards were printed in the United States. It’s interesting to see that the Nash Square neighborhood might include hotels again one day, especially if the public safety center and N&O complex relocate. Sorry my first message listed my email as csbetle@aol.com. That was incorrect.